Single Replacement Acme Screw Jack. The RV industry’s first redundant safety check system! Lifts an astounding 1,500 lb. per jack. Protects you and your camper against mishaps or failure. 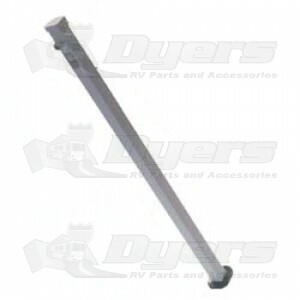 Z-bracket mounting system is easily installed and/or retrofitted onto most campers. Can be easily upgraded from manual, hand crank jacks into a remote controlled electric jack system with the purchase of the Electric Motor Drive. Square 2", powder coated inner and outer tubes which are significantly stronger than round tubes. Concave footpads reduce movement and provide maximum stability.